I am using Standard Chartered Manhattan card and I am in absolute love with it. 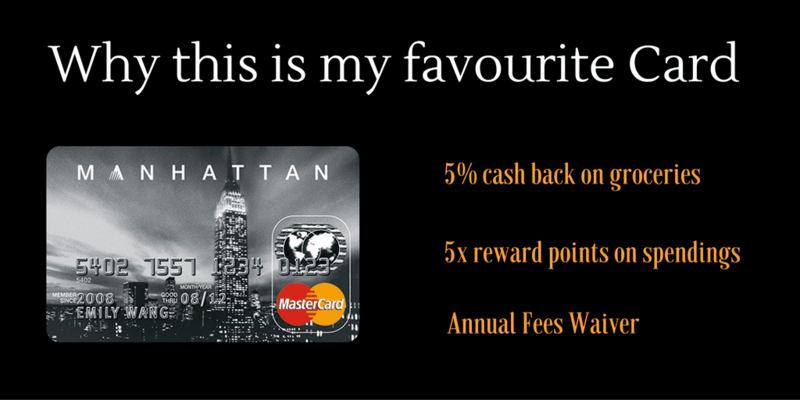 Why am I reviewing Manhattan card? I applied for this card to get 5% cashback on groceries. SC Manhattan is probably the only card which gives cashback on shopping on groceries in superstores like Big Bazaar, Reliance, Easyday, and More. With continuous usage of standard chartered manhattan card payment, I observed that it is the best credit card for cashback in India. There are other cards which offer benefits on travel, lifestyle and foreign transactions but Standard Chartered Manhattan card have a better reward redeem ratio. You got it right! I use Standard Chartered Manhattan Credit Card for virtually every type of shopping. You might be wondering why I spend so much money through a single credit card. Most of the credit card companies play a game of reward points. They offer reward points per 100 rupees but often the redemption value of rewards is very low. I get 3 reward points for every 150 rupees spend. Every reward point is worth 30 paise when I redeem. To get maximum value, I redeem 3400 points for 1000 rupees amazon voucher. I redeem the points for the amazon vouchers. In addition, If I spend about 10000 rupees every month on groceries and receive cashback of Rs. 500. Note: My actual annual cashback varies because of fluctuations in my monthly expenses on a credit card. Annual Fees – The card comes with joining fees of 499 and annual fees of 999. The fee is nothing in front of benefits. They do not write on their website but in most of the cases they waive off joining fees and first year charges. I get the annual fee waived off every year by talking with SC customer representative on the phone. Here is the recent proof of last month. You will receive a call after your online application. Ask the person if they can waive off joining fees and annual fees for the first year. In 99% cases, you will receive your card free of cost for the first year. You must have a stable source of income to get any credit card. It’s difficult to get your card approved if you are not a salaried employee. They prefer employees over business owners to mitigate credit risk. You must have good credit score and excellent credit history. You can read how I improved my Credit History. It’s always difficult to get a credit card for freelancers, small business owners, housewives and people with a low salary. There are few other ways to get your Standard Chartered Manhattan credit card even if you are not eligible. Apply card based on your other bank credit card. If you do not own any credit card then apply for ICICI or HDFC credit card with the help of Fixed Deposit. Apply card based on your life insurance. When you click on this application link, you will see the following screen. You will receive OTP on your mobile that you have to verify to complete the application procedure. You must fill up your PAN card number in the application along with other mandatory details. You will receive your application number on submission of the form. Keep your documents ready for quick application approval. You never know when you can get your card approved. Sometimes banks need to increase their credit card customer base and they relax their approval criteria. This review comes directly from my experience. Let me know in comments if my review helped you or you may have any further questions! You can apply for SC Manhattan card by clicking here. Your chances of approval are more if you already have HDFC credit card. Pardeep, Good article. Well articulated. I have a home loan since the past 6 years and haven’t missed a single instalment ever. Suggest a good one for me please. Is Manhattan card gives cash in place of credit in bank account.? I dont do any groceries shopping and maximum usage is dining and utility bills, what do u suggest? I am an HDFC Regalia Card holder, however, I am thinking of switching over to another card as I found some discrepancies in their latest statement. I have been a customer of HDFC for over 14 years. How many months after issuance of card is joining fees and annual fees charged ? What if I buy from a departmental store products <1000 rs will I get reward points ? Hi, I don’t do any groceries shopping and maximum usage is dining and utility bills, what do u suggest? Check the latest article on credit cards – StanC SVT card offers 5% cashback on utility bills. The SCB rejected my application for the Manhattan as I am a business owner. how can I get one? Should I apply again? I spend lot on dining(any restaurant) and clothing. What is the card do you suggest? Hi. Is any kind of superstore included? I shop only at Metro and not at other stores, so… Also, I did apply to this card last week and should get approved easy. However, what are the hacks to get the joining/annual fee reversed? What do you exactly tell the rep on the call? Is there Free Airport Lounge access for this card? How do you take care of that, which card you will use for what purpose? How do you keep record & Track of that? Tips for managing the cards. Use card based on best award offers on particular category. I use Manhattan for grocery shopping, HDFC Regalia for international spends and other cards as per the offers available. The problem with SC is that most of their customers become victims of international fraud transactions. So I am afraid, if something like this happens, I’ll put myself in great trouble. And unfortunately, only SC CC customers are victims of such frauds. They cheat their customers by sharing card details I guess. This is not good at all. I have been using CC of many banks but I have found worst service of Standard Chartered bank. The way of communication with customer & bank staff are highly unprofessional. Bank has designed its customer communication channel is such a way that if customer raised any complaint then he/she automatically get fed up and give up to its complaint. HIGHLY NOT RECOMMEND SC BANK CREDIT CARD AND BANK ACCOUNT. Every customer has unique experience with big companies. There could have been bad instances with SCB but that never happened with me or with anyone in my circle. #1. Call Connect Time – SCB calls get connected way faster than ICICI and HDFC. Amex is fastest in my experience so far. #2. Representative – I have seen professional representative on SCB and American Express. The worst are ICICI so far. Having said that, I never went to their bank. So no experience with their staff. So far, I am loving the offers and deals on SCB credit cards. You can 5% cash back in Dmart, am not sure about Metro. Even I asked the complete list from SCB but they don’t have one. SCB website is not giving out clear information on which stores expenses are eligible for 5%. I believe the stores which are registered as supermarkets. So D-mart and Metro should be covered. Why don’t you try that once and update me if you get 5% cashback or not? Hold your credit card for 6 months before applying the second one. Will I get 5% cashback for shopping in D-Mart (I shop there only) ? Will I get 5% cashback for online shopping sites like big basket or groffers ? Do we get any rewards points while loading money in 3rd party wallets like Paytm, Amazon Pay etc ? You will get 5% on D-mart but not on online grocery sites like bigbasket. I use Amex Gold card for loading money in paytm and Amazon so I am not sure if you will get reward points on Standard Chartered. Just one more question out of curiosity…. Does any credit card provide reward points for loading Money in wallets like Amazon pay or Paytm? As per my knowledge there are none.